The Wingabago® is easily secured in the car by using your car’s seatbelt system. Keeps curious beaks contained. They can’t chew through your armrest, seat belt strap or car upholstery. We’ve heard stories! Won’t damage you or your car. There are no sharp edges to scratch or gouge you or your car upholstery. The most important feature is that birds really love their Wingabago® . They can see everything going on around them, but they feel safe and secure inside their Wingabago® . Time Out Room. We don’t like to think the Wingabago® could be associated with punishment, but it works! Buster, the Amazon in the small carrier picture, is quite the screamer. When the pain gets too great, Buster gets to spend some quality alone time in her Wingabago® . The Wingabago® comes with everything you will need. 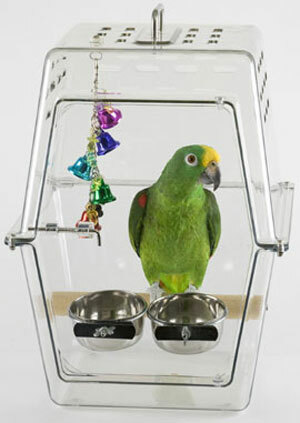 Both size carriers come with 3 dowel perches (3/4”, 1”, and 1 ¼” diameter), 2 stainless steel food and water cups, the all important toy hangar, and a travel safety guide. This is great for car travel. We put it on a box that straps down and our grey can watch the scenery. We bought the SS door for circulation but will use the high impact door for air travel. Our bird gets excited when he sees the carrier. I put a soft rope toy inside and bought a lixit bottle for travel, so now we can take him almost anywhere. Get the cover, it's cute and necessary sometimes. What an awesome cage! Easy to put together and my Ringneck loves it! 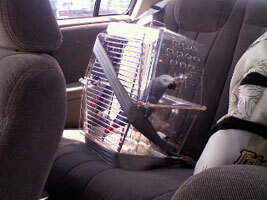 I use it for African Greys who travels with me quite often. They love to look out the car window. It also doubles as a cage in hotels. Both my birds have one and never hesitate to go in it. I can also use it for misting and very messy foods. Cleans so very easy. I use them almost daily. I highly recommend them. Q: Is the small size big enough for a Goffins Cockatoo for all day car rides? A: I'm not totally familiar with the range of size for a Goffins, but from what I can tell, I would say yes. A: Yes, the doors wings open. And yes, it can be seat-belted on a car seat. Q: Would the small size Wingabago be to small for an African Grey parrot? Do you have any idea when you will be getting the larger size Wingabago in? A: That depends on what size Grey (congo or timneh) and what your purpose is. 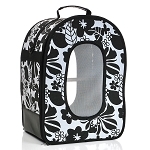 It probably is very good for short trips to the vet and such, but for long term keeping I don't think either carrier would be large enough. There is no current ETA on large Wingabagos.